Soha Ali Khan is going through her pregnancy phase and has always been candid while sharing pictures of her little moments that come her way in everyday life. The Dil Maange More actress never forgets to keep her fans updated about her activities and the way she is enjoying the most precious phase. 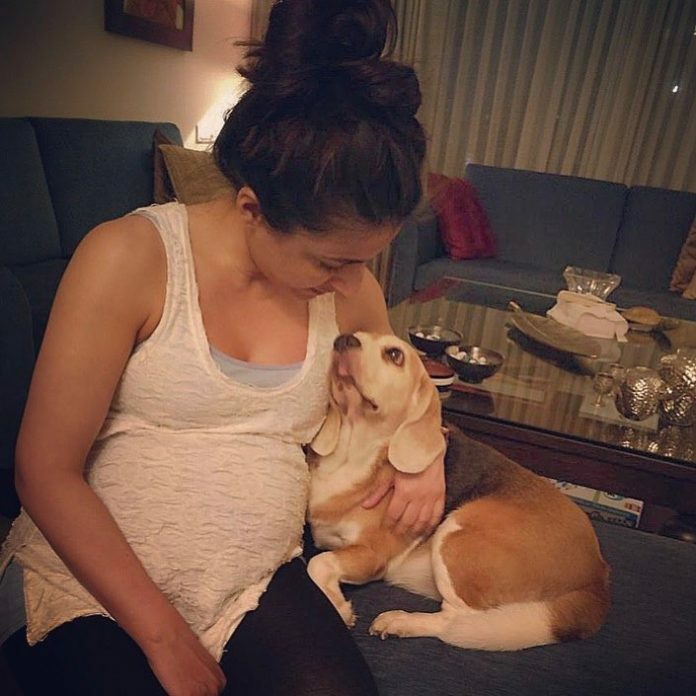 Soha Ali Khan, who is married to Kunal Khemu shared another picture of her and this time with her pet dog. The actress can be seen wearing a white tank top while she lovingly cuddles her pet dog at home. Soha has so far shared several pictures right from her baby moon, her baby shower, workout time and her moments with her pet. The Ghayal Once Again actress had earlier shared a picture with her nephew Taimur Ali Khan and her pet dog. Soha has never shied away from sharing pictures of her baby bump and has also posed for the shutterbugs whenever she is snapped outdoors by the paparazzi. Soha and Kunal’s baby is due to be delivered by the end of 2017. The Mumbai Meri Jaan actress got married to Kunal Khemu at a private wedding ceremony in Mumbai on January 25, 2015. The two had got engaged in Paris in July 2014.